This is the first of five Demonstrations about Condorcet's jury theorem (1785). 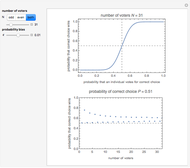 It uses the formula , where the probability and is the number of voters. 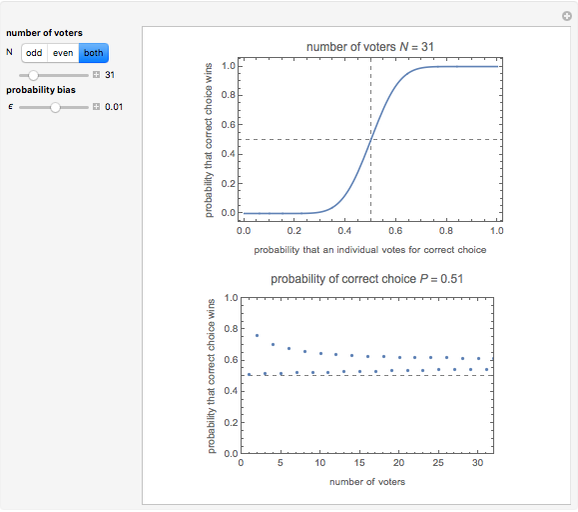 The theorem states if the voters are independent and each has probability of voting for the correct choice, then the probability of the majority voting for the correct choice is larger than and converges to one as the population goes to infinity. 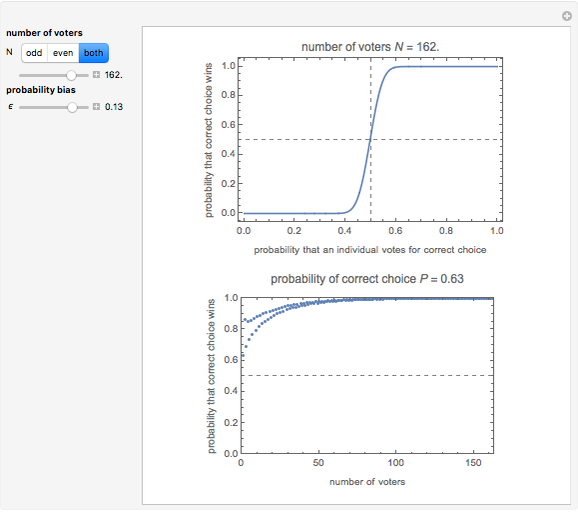 Condorcet's jury theorem (CJT) is one of the most fundamental theorems in voting theory and related fields. Suppose a community of independent voters faces a yes/no decision on which there is some correct or best choice, and each voter has probability of making the correct choice individually. 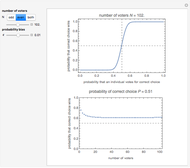 If is the probability that a majority of the community makes the correct choice, then if , . The proof of the theorem is easy (i.e., by induction) and the formula for is also well known (see the formula in the caption). In a series of five Demonstrations, of which this is the first, we try to see and confirm this theorem from various viewpoints using numerical simulations. 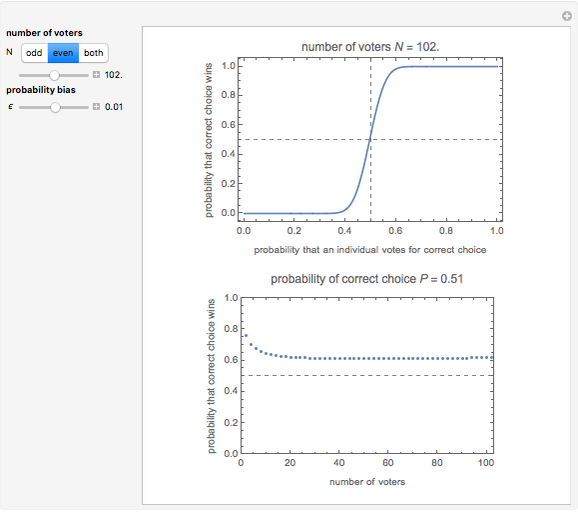 In this Demonstration we show the theoretical characteristics of the model in terms of the probability bias defined by and number of voters . 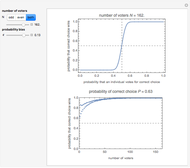 We show how quickly (or slowly) the probability converges and how odd and even population sizes affect the theoretical results. In these Demonstrations, neutral decisions in which the votes are divided evenly are assumed to be correct decisions. H. Abdi and P. Molin, "Lilliefors/Van Soest's Test of Normality," in Encyclopedia of Measurement and Statistics (N. Salkind, ed. ), Thousand Oaks, CA: SAGE Publications, 2007. Marquis de Condorcet, "Essai sur l'Application de l'Analyse à la Probabilité des Décisions Rendues à la Pluralité des Voix (Essay on the Application of Analysis to the Probability of Majority Decisions)," 1785. Tetsuya Saito "Theoretical Model: Condorcet's Jury Theorem, Part 1"